The latest release of ESO’s Virtual Tours includes the option to view them in virtual reality mode as well as 360-degree panoramic mode. 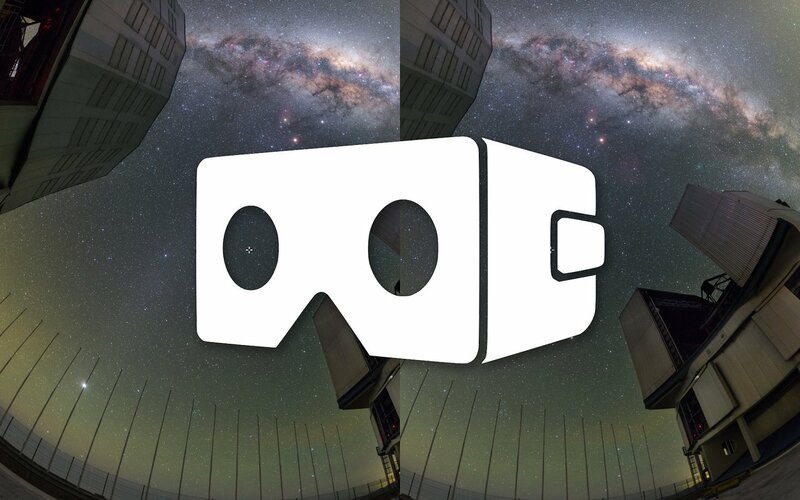 You can now use a cell phone with either a standard cardboard virtual reality headset or oculus rift glasses (instructions here), to experience tours of ESO’s facilities in an exciting new way. This latest release also includes new and updated virtual tours of ESO’s observatories and facilities, bringing with them better functionality on computers and new panoramic views taken during the recent fulldome expedition. Marvel at ALMA’s majestic dishes as they study the iridescent night sky, then pan round to see the starkly beautiful Chajnantor plateau in Chile’s Atacama desert — by day, by night, at sunset and at sunrise. Visit two of the most technically advanced and productive astronomical sites in the world — Paranal observatory and La Silla, ESO’s first observatory. You will be able to step inside one of the Unit Telescopes that comprise the Very Large Telescope (VLT), getting a glimpse of its intricate design. And you can explore the site of the future Extremely Large Telescope (ELT) — the world’s largest optical/infrared telescope — that is being built on the neighbouring Cerro Armazones. Finally, take a look around some of the buildings that house ESO’s staff and visiting scientists. These architectural pearls include the Santiago Guesthouse and ESO’s Headquarters in Garching, a twisting maze of a building that sits next to the nearly completed ESO Supernova Planetarium & Visitor Centre, due to open in spring 2018. ESO’s collection of hundreds of 360-degree panorama pictures can be used for many purposes — they can be imported into Virtual Reality systems, or into planetarium software for display in planetariums worldwide. All panoramas are available via this link. To begin exploring in virtual reality mode, follow the instructions in this user guide. The images that go to make up this stunning collection owe their existence to the hard work and dedication of ESO’s Photo Ambassadors.